A buddy and I are fixing up a hunting club we purchased. The place needs new countertops as the old Formica was peeling up. We have a plywood base and we are trying to figure out what to install to replace it. Stone is out of the question and we don’t want laminate. We tossed around the idea of doing tile countertops out of the stuff that looks like planks of wood. Our other idea was to take hardwood flooring and lay it down over the existing plywood countertop base. My concern is that expansion/contraction will lead to jacked up countertops down the road. But people glue up plank boards all the time. Anyone have any experience with something like this? I've got a countertop that I made from joining strips of different kinds of wood (maple, oak, cherry, mahogany, and holly). After a hurricane knocked a bunch of trees down in the woods behind my house, a friend and I cut the best of the trees, hauled them out of the woods, and hired a guy with a portable saw mill to cut them into planks. The strips were from odd pieces left after sawing the boards. I just glued them and clamped them. Anticipating that it might split, I put some fiberglass on the bottom. There are no grooves in the countertop where the wood strips have separated from one another, even after about 8 years (still looks like new). It's held up very well, though I don't really use it for food preparation. I think the hardwood flooring idea would work. However, when the wood contracts, you might end up with some grooves in your countertop. Maybe gluing each tongue and grove mating surface and using cabinet clamps to pull it all together would keep it from opening up. But, it's a cabin, so a little imperfection is fine. I'm assuming by hardwood flooring you don't mean a thin strip of hardwood manufactured on plywood, but through and through hardwood. You're going to run into two problems. The movement is side to side, not end to end. It's easiest to leave the end cuts exposed rather than capping them. Any cap on the ends has to leave room for movement. Second is fixing it to the plywood base. If you try to glue the whole thing down it will crack/warp over time because the hardwood moves and the plywood doesn't. Easiest thing to do is glue and clamp your bar top together on a separate flat surface. Then fasten the top to the plywood w/ glue and screws (from underneath) down the center line lengthwise. Sand/route/stain/seal however you want. If it's tongue and groove you'll have to cut the tongue off the one side and leave the groove (or fill it w/ wood fill) on the other. If it's not you'll have to use biscuits to marry the flooring. Form it up and pour concrete. GetReel, Jersus, gofastsandman and 3 others like this. you can get it in all colors and designs. Lowe's and Home Depot sell pre- laminated sections of MDF with 45 degree miters already cut in lengths of 4', 6', 8' and 10'. The bottom sides are pre- prepped for the clamps that are sold with the sections. Each section has a small "curb" at the front and a 5" or 6" back splash at the back. Back splash is mitered also from the factory. I'd pull the existing/remaining plywood up and screw these down. Properly shimmed of course. You can't tell the difference between custom and these if you take your time and think it through. Epoxy pour is always an option. Did one at my house over plywood and some charts I had kicking around. savage, Esuomm1, rusty spoke and 4 others like this. That's a great idea. Instead of charts put a terrain map and areal sat images down for the camp. SeaCat22 and dr_bw like this. Absolutely, can put anything under there. I would steer clear of tile. Every one I’ve ever seen looks like shot after a few years. Formica or go with a IKEA butcher block. Cheap and somewhat durable. Agreed, def would not use hardwood, unless its edgrained like butcher block. Get more Formica sheet and glue it down. That stuff is hard to beat for cost/value and longevity. Very easy to work with too. Yes or anything else that is sanitary and easy to clean. Fake corian if you can find it or something cheap but again easy to clean and germ free. 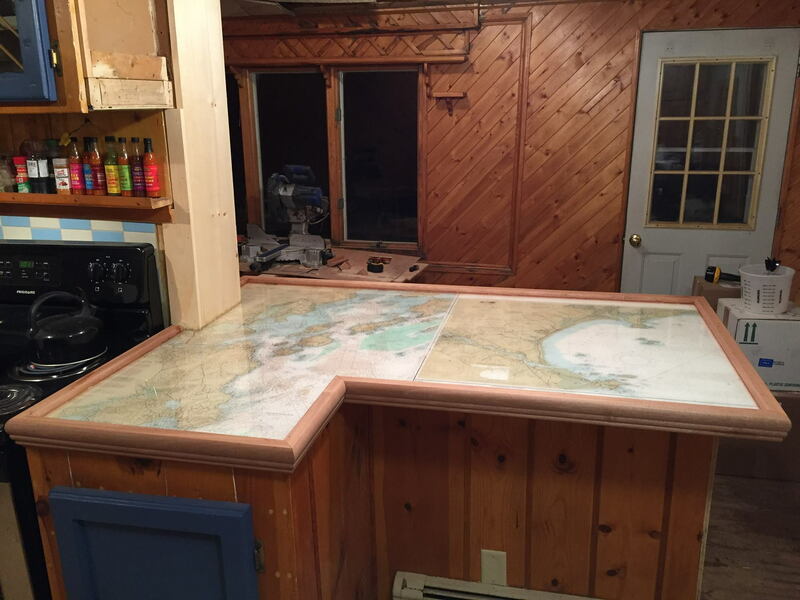 My bother picked up some sections of an old bowling alley and made a bar out of it. Wrapped it in oak cornices and poured epoxy on it . Turned out really nice. Can you make it the same as your flooring surface?